Halloween is just around the corner and kids already have candy on the brain! I know it seems like candy and Halloween go hand in hand, but I’ve found some kids’ healthy party food ideas for Halloween that are also easy. The boys will go crazy over the Witch Fingers, Olive Snake, and Crunchy Halloween Mummies. The Goblin Grins and Cheese Pops for Halloween will fit in flawlessly with the party decorations. The Pumpkin Guacamole and Frankenstein Veggie Platter are ideal for larger parties since they don’t require serving up appetizer portions ahead of time. You can even forego a cake or cupcakes and just put the Monster Fruit Dip right on the dessert table. Not throwing a Halloween party this year? No problem. The Ghostly Eggs, Honeydew Bats, and Cereal Monsters would be so perfectly scary to have for a Halloween breakfast, while the Egg Salad Creatures, Skeleton Grahams, and Creepy Spiders on a Log would be great to pack in a lunch bag. Give kids something fun to do with these 14 Spooky DIY Halloween Projects and Crafts perfect for kids of all ages. Parents and kids will love these 10 Easy Halloween Party Crafts for Kids. These spooky eggs make for a perfect Halloween breakfast or maybe a festive after-school snack! With some black food coloring create your ghost’s spooky faces. These eggs will give anyone who takes a peek in your fridge a fright. Your kids will love coming home to this silly monster treat. Not only would they be fun to decorate with kids, but they also taste delicious too. A perfect healthy Halloween alternative to candy. These witch finger look-a-likes will be the perfect addition to your Halloween party snack table this year. With carrots, a dollop of peanut butter, and apple skins, these not only look festive, but taste great. Your guests will enjoy these crunchy and creepy snacks. While egg salad definitely isn’t the first thing to come to mind during Halloween, it creates the perfect canvas for little monsters. Let kids create their own creatures using fun add-ins for their egg salad. A healthy after-school snack and it will keep the kids entertained and laughing! A win-win for sure. Chips and dip are a necessity for any Halloween party snack table. This is a super easy way to put a fun twist on the traditional snack. By placing your delicious guacamole in the mouth of the pumpkin, you can get a fun centerpiece for your snack table. While it may be a little gross, it’s perfect for Halloween and your guests are sure to love it. Create some creepy claws or terrifying teeth for a sweet party treat. For a sweet alternative to the traditional candy or cupcakes, try out these tricks using apples and peanut butter instead. To make it even sweeter, add in the chocolate chips on top for more fun! This monster fruit dip is sure to catch eyes at your party. Fruit is already a sweet treat, but this dip makes fruit even better. Toss in some candy eyes for a fun and creepy effect. You can also make the fruit more fun too but creating different shapes to fit the theme for Halloween. Everyone has heard of ants on a log, but spiders on a log sounds much creepier. These treats are sure to give your guests a scare. Instead of the plastic spiders, try using raisins for a sweet addition. Bring boring graham crackers up a notch and turn them into spooky skeletons for Halloween. To get your chocolate fix in a little bit healthier way, use chocolate graham crackers as a backdrop for these guys. With some marshmallows and candies, create your creepy skeletons however you want right on top. Fruit is always a sweet treat, so try these out! Using a cookie cutter, cut out your favorite Halloween shapes from honeydew. Try using a pumpkin shape and cantaloupe for another treat. Slithery snakes aren’t something I’d want to find in my food…unless it was made out of olives. This snake perfectly sits on top of your favorite dip on your party table. This guy would make a perfect centerpiece for your party. Try out a little bit of a savory treat to cut through all the sweetness of Halloween. These crunchy and tasty treats would make a perfectly themed appetizer for your party. Guests are sure to be in awe of your handiwork creating these snacks. Even though Halloween is all about the candy, you still need your vegetables. This festive snack is the perfect way to do so. With some vegetables, create these creepy grins that look as if they’ve come right off the face of a goblin. These snacks are perfectly easy to make and any cheese-lover will be sure to enjoy them. Simply put a stick into a Babybel cheese and decorate, it couldn’t be much more simple. Create these smiling skeleton faces or try out a spooky ghost instead. Give your guests some variety with this spook-tacular platter! This creative plate could easily be the centerpiece of your table for Halloween. Though, with all of the delicious vegetables on the plate, your guests are sure to gobble them up in no time. Plan a spooktacular kids’ Halloween party with these great resources gathered by the team at Spaceships and Laser Beams. Need more Halloween Party Food Ideas? 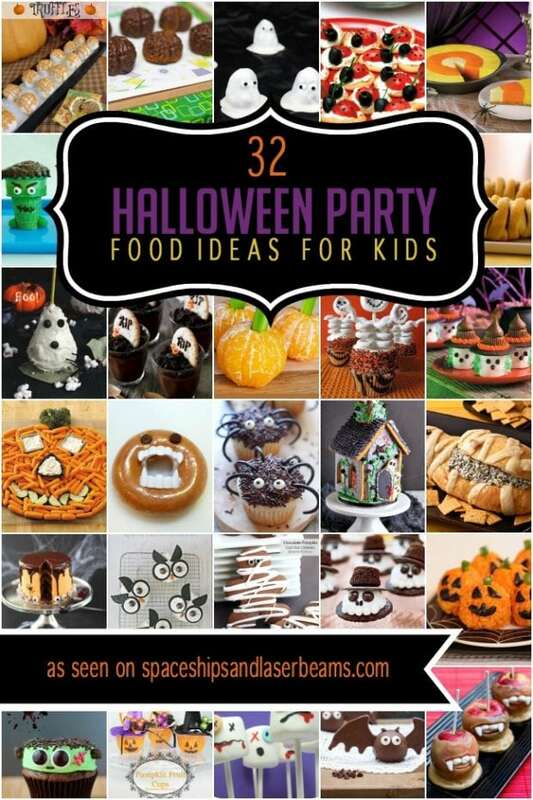 Check out these great Halloween themed party food ideas perfect for kids.